Now before you tell me I’ve gone off the deep end, realize I said it’s the best card that isn’t out there in the meta. I played 247 games last month, and, as of this writing, I’ve now played 97 games this month, and I have yet to come across Zygarde (FLI 72) even once. And no top finishing deck in any tournament played it either. 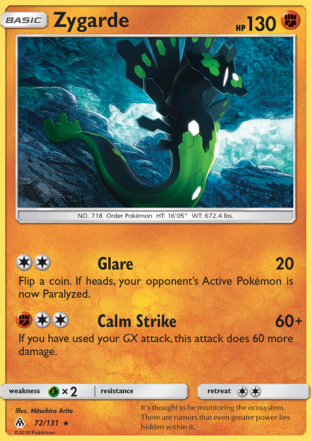 Everyone has passed over Zygarde 72, and that’s a shame because it’s the best single prize attacker to come out of Forbidden Light. I went 15 W 7 L with this decklist, 8 W 3 L in my last eleven matches. Even more impressive was my 9 W 3 L record against meta decks. It’s not the best deck in the format, and I’m not even saying it’s a Tier 1 deck. But it is a simple, straightforward, uncomplicated archetype that is easy to play. It revolves around abusing Max Elixirs and loading up as many Pokemon as you can with three energy cards and lining up three or even four Zygardes in row, ready to do 140, 170, or even 190 damage, turn after turn after turn. I chose to try the Drampa Big Wheel, Hala, Cynthia draw support engine to see how that will work post rotation. It was fantastic, there was only one match when I really bricked (and of course that was the final round of a tournament on PTCGO). I also remarkably only started Drampa five times in the 22 matches! I did go 4 W 1 L when starting Drampa. Big Wheel GX is a great advantage, and knowing that I’m drawing 6 or 7 cards every time I play a Supporter gives me a lot of confidence – so much that I cut out any Tapu Lele’s from this list. And that’s the best of all: it’s a budget deck! Who would’ve thought that I could build a budget decklist, but here it is. If you’re looking for a good, single prize, mid to high 100’s damage machine, this is your deck. Like I said, abuse the heck out of the Elixirs, and Zygarde 72 will win you a bunch of games. Harvey I’m not gunna lie, I never thought you would touch this card, not even with a 24 and a half foot pole XD Dr. Seuss reference aside, It really relieves me to see this card finally looked upon. Really makes me wanna try the list out for the fighting type challenges on PTCGO since the most obvious go to decks are Buzzwole, which is cool but sometimes you just want to swap things out too (as a random note, I can honestly say that Baby Buzzwole, Beast Ring, Diancie, and Mew make Buzzwole less boring to play than before: still somewhat of an Autopilot deck, but still). What I also liked about your analysis of the deck was that you used Zygarde (but mainly Drampa’s inclusion) to experiment with the future of the draw support line, and it appears that you felt pretty comfortable with the Drampa/Hala/Cynthia Line. That’s actually quite nice, and maybe I’m gassing this statement up, but I believe that you have given some confirmation to one of the post rotation draw engines, that it will work just fine and it will be build upon once Copycat comes into play as well. And about Garchomp….if you do go Garchomp, I would experiment with Lycanroc or Pokemon Catchers, counter catchers, and for the fighting variant even try it with Strong energy, Diancie Prism, and tech in a Lucario GX, because that’s what Garchomp struggles with: being forced to lock yourself into a single supporter, while the opponent just decides “Hey I know you won’t win the game if I leave my single prize pokemon out, so here. You won’t Guzma for game”. Fighting Chomp…he OHKO’s Zoroarks. Add strong energy, Diancie, And Choice Band and he OHKO’s Leles without Cynthia. What else does it need….well, that needs to be seen (perhaps Altaria might even be the way to go post rotation, if a bit clunky). For me, I’ve noticed that Garchomp does get played around, which is unfortunate. Strong budget deck, but like Empoleon, smart players can work around it all (random I know but I just thought of something cheesy with Empoleon: using the Metal Variant with some Counter energy and Dhelmise, but the bench space way too tight so no). Now this might be a bit cruel of me to share…but for Garchomp, it pains me when I use it and it forsakes me, and it pains me when the opponent uses it and it forsakes them. Why am I saying this? Because last night I was doing my Dark evolution challenge with a budget deck of my own (Hoopa/Zoroark) versus a dragon Garchomp….my opponent had trouble setting up, Hoopa took out the smaller mons (which included a Gabite), and by the time Garchomp came out, it was too late. Imagine using Garchomp and the opposing board had a Zoroark and two Zoroark Breaks on their side, not even the GX. What took the game? As you might’ve imagined, Foul Play after using Cynthia…yeah. To close my remarks, Turbo Lapras: very fun and aggressive deck for Water Challenges. It really does it’s job out there in the format. And it was funny how Alolan Exeggutor was built for the budget side of things before Madison regionals came out, and lo and behold: someone actually won with it (even though it was arguably just another Zoroark deck). Yeah it’s the case with ZoroGardy from months back in that it’s mainly just a Zoroark deck, but compared to the things I’ve read about how the format was stale, Buzzwole should be banned etc, it was just nice to see something refreshing like this, where someone saw the new Alolan Exeggutor and was like, “You know what, I think this could work: lets get to it”! Strong single prize mon, wrecks Lycanrocs and Lapras, and hard to one shot. Even the GX got a spot. So is creativity dead in this format? After what happened with that Exeggutor deck and what you showcased today, not at all: there’s still things that can be done. Hey Juan – yes you are correct I would never have tried this card if it weren’t for Pojo reviews forcing me to do my due diligence. And it fits in just fine in Buzzwole GX decks because they often play Absorption GX early on so as to still be able to Knuckle Impact during their next turn. The Drampa Hala Cynthia draw support engine was great. I agree on copycat – it should at least be a one of. Garchomp, I’m just not sure what to think of that deck. I thought it might actually be good as a Fighting type. But then again I thought Buzzwole’s reign of dominance was over after Malamar’s arrival. I paired Lapras with Abomasnow and it worked really well. Lapras is a good card – not as good as Buzzwole but it’s alright. But thanks for your comments Juan, appreciate your visiting the site. But it’s probably likely that I was still learning to get used to the deck itself (with at one point deciding whether I would attempt to Glare or attempt to get Drampa active for Big Wheel). It has some explosive moments, but it has the chance to fall to larger predators. Still, for a budget Lele-less deck, this one absolutely does its job…one might even slap Counter Catchers or even Baby Buzzwole for the surprise factor. Regardless, the beauty of your build is that it’s not only a strong budget build for players, but also that it’s flexible: it makes you think what you could do to make it better and stronger and more to your liking. And to be honest: seeing Zygarde do just fine made me wish the Baby Bulu would come out already. Nearly identical stat lines and attacks, only difference being that Bulu’s first attack heals 30, inflicts 30 to opponent. So seeing your build, you can probably imagine what decklist would be made while adding the promo Lurantis. As a side note: I finally saw baby Dusk Mane in action today. Dusk Shot was used and Metal Frying pan was as well…this was a Naganadel variant but boy was it a close match (thankfully I teched in that Mew at the time to deal with the Poipoles and Nadels). Was frying pan still bugged? I noticed wishful baton was bugged last night. None of the top decks last weekend ran Field Blowers so I was going to try wishful baton and Steam Siege Hoopa but after one of my fully loaded Hoopas went down with baton attached and it failed to transfer energies I quickly conceded and walked away from that idea. I’d also like to try frying pan with Solgaleo gx and see if anything can ohko me! That Wishful Baton bug you mentioned shocked me: I don’t think it should be bugged. Granted if Lysander’s Lab was out then of course Baton would fail, if an ability made tools useless that would be a thing too, but if neither was the case I would try to follow up with PTCGO by reporting the bug with the game log of it as well. Not sure how it’s done, but yup: it should get looked at. I’m hoping Wobbufet isn’t bugged however. I’ve yet to see Wobb/Malamar because of that wretched bug in May, which is a shame because in theory…if you combo Latios with Wobb against Buzzwole: Latios will hit 60 on the active, 30 on the bench. Wobb comes in and inflicts 140 for weakness the following turn, which is a knockout on that Buzz, and the list goes on and on when you factor Necrozma’s GX attack, and the future release of Psychic Lele. But who knows…try Frying Pan and see if anything happens! Baton might have gotten bugged when they did the recent update to the game with the inclusion of the HG/SS packs.